We have had several projects in Rehabiliation that you can read about them below. However, some of them are not active at the moment. Our active project in this area is the one on spinal cord injury (the first project below). Evaluate the technology by an exercise regime on 5 people with SCI. This project is currently in progress and supported by the Thorlakson Fund of the University of Manitoba. So far, the objective one of the project has been achieved. The photo below shows the device. Good balance and mobility are necessary in order to independently perform acts of daily living and to avoid falls causing injuries and/or hospitalization. Balance is a functional term that is most commonly defined as the ability to maintain and control the position and motion of the total centre of body mass (COM) relative to the base of support. The trajectories of the COM and centre of foot pressure (COP) provide measures of stability and are important parameters when modeling the human postural control system. Motor control must be considered during both static (base of support is stationary) and dynamic conditions. For example, when an individual takes a step or begins walking, the base of support becomes virtual as the central nervous system estimates a projected base of support area where the swing foot will be placed. Research in this area is focused on modeling of the motor control system, diagnosis of system degradation and rehabilitation of balance disorders. Balance of the human multi-segmental system requires the integration of sensory inputs that have unique internal (segment to segment) and external (gravitational vertical and ground) frames of reference. Visual sensory input provides the central nervous system with the position of the body in relation to other objects in its environment; relative reference frame. The visual input determines characteristics such as the velocity, surface texture or height of an object, in order to anticipate, in advance, any obstacles that could have a detrimental effect on maintaining balance. 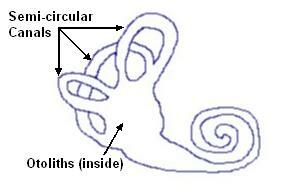 The vestibular system consists of three semi-circular canals, which act as angular accelerometers, and two otolithic organs, the utricular and saccular macula, which are gravity receptors that function as linear accelerometers to provide the only absolute, external frame of reference in the body; vertical. Vestibular sensory input provides the central nervous system with the body's linear and angular accelerations from which the position of the body, with respect to gravity, can be interpreted. This information is also used to maintain stability of the eyes during head movements, in order to provide stable visual input; gaze control. Somatosensory input provides two different types of spatial information; an internal reference and an external reference. Proprioceptors, internal signals from within the body such as muscle spindles, provide the central nervous system with the spacial orientation and movement of a body part relative to an adjacent body segment. Exteroceptors, such as pressure (cutaneous) sensors in the feet, provide the orientation of the body with respect to the ground or support surface. The cutaneous inputs located on the bottom of the feet also provide information about the ground reaction forces of the surface. The forces acting on the body, the different tasks a person performs and the environment that the task is performed in, all have effects on how balance is controlled. The main forces acting on the body that the central nervous system must balance are gravitational, motion dependant, ground reaction and muscle forces. When a perturbation causing movement of the center of mass relative to the base of support occurs, or in the case of a sudden loss of balance such as standing on a moving bus during an acceleration, timely corrective actions must take place in order to maintain equilibrium. During quiet standing, the body can be approximated as an inverted pendulum, with the ankle as the pivot point. As an inverted pendulum is unstable, minor perturbations at low translation frequencies will cause a swaying motion; the Ankle Strategy. This sway, which is indicative of the body's attempt to maintain equilibrium of the center of mass in relation to the base of support, is a corrective action based primarily in response to somatosensory feedback; however, the amount of sway increases in the absence of other sensory inputs. For minor to major perturbations at higher frequencies, or in an environment where foot movement is restricted, the body will attempt to regain balance via the Hip Strategy. In this strategy, the body can be approximated as a dual-segment inverted pendulum, with the trunk as one segment and the lower limbs as the second. The upper body muscles are contracted causing movement about the hip in order to maintain balance. The movement of the body segments is faster in this strategy in order to combat the larger disturbance of the body's equilibrium, and therefore achieve a more rapid stabilising of the center of mass. When there is a major perturbation that causes the center of mass to be moved to a position, relative to the base of support, where equilibrium cannot be maintained, the person will take a step in the direction opposite to that of the perturbation. In this case, the base of support is moved as opposed to the COM. This is known as the Step Strategy. Dynamics of balance behavior for a multi-segment system, under feedforward and feedback conditions were investigated with a system input-output approach. Using a compliant foam pad as the support surface for standing and balance assessments, we have investigated several technical aspects of such devices. Firstly, we sought an alternative to the traditional, expensive and time-consuming technique of using a motion analysis system for quantification of balance performance, i.e. center of mass (COM) calculation. For this purpose, we investigated several models to estimate the resultant COM trajectories during standing, stepping and walking. The results have been very encouraging (above 90% accuracy). In parallel to COM estimation, we have developed a novel motivational and interactive exercising tool for patients with balance disorders, which has also been filed for patent (pending). We have been the first group who has estimated COM without any need for calibration without using video motion data. This is particularly of interest as having an accurate estimate of COM adds a very important clinical information to all video-game based exercises that are used for rehabilitation of patients. This research is integrated to instructional activities and was accompanied by two M.Sc. thesis and one Ph.D. work. It is also incorporated in the Biomedical Engineering Course as an example of a new biomedical research area. This work has resulted 7 journals and 9 conference papers that can be found from publication page. There are millions of people worldwide who are suffering from disabilities. There are approximately two million people worldwide living with spinal cord injury. In general, people with disabilities require supervision or assistance in most of the daily life tasks, which causes a significant expense on the health care system and/or families. Advances in technology, especially in the last three decades, have greatly improved the independence and quality of life of handicapped individuals. The design of robotic arms for rehabilitation, although not yet fully practical, is one of the challenges of great interest in the field of Rehabilitation Robotics. 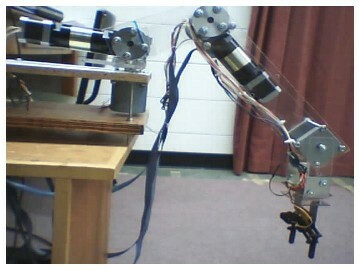 One of the main daily activities that a robot arm can be used for is object grasping. To have an intelligent object grasper, the system must be capable of detecting an unknown object from the background under any environmental condition. Furthermore, the system must be practical in terms of computational speed and must be applicable to users with mild to severe disabilities. We have recently developed an automatic and intelligent robot arm for object grasping for people on wheelchair with mild to severe disabilities. The system is equipped with stereovision detection in order to distinguish different objects from the background. The robot arm has been designed with 6 degrees of action to grasp the detected object from the floor and bring it in front of the user. Two pre-calibrated digital cameras, facing downward, simultaneously take pictures of the surface where the object is located. Then by applying a new and robust 3D object detection method, the height, location and orientation of the object with respect to the robot's base point are found. The resulting rotation periods are transferred through a designated electronic driver board to the joints' motors via the PC parallel port. Overall, the system detects the object, moves the robot arm to the location of the object, grasps it, moves it to a predefined position in front of the user, releases the object and finally returns to its home position. The system is automatic and is operated by only one command. To read more about this technology you may look for a paper with the first author Farahmand, Fazel. Investigating the relationship of the preferred direction of the involved muscles' electromyographic (EMG) activities and adaptation during reaching movements. Measuring the muscles' coactivation along with kinematics data to investigate any change as a result of adaptation and/or generalization. The above photo is Chad Macdonald who is now a postdoctral fellow in industry. 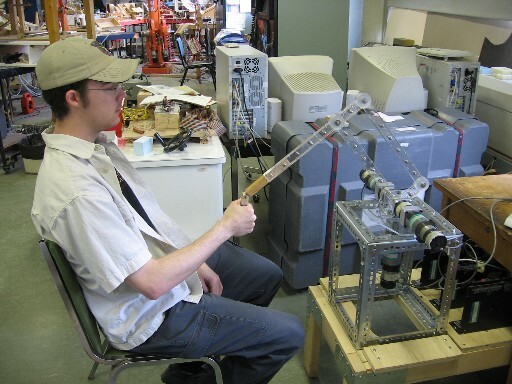 He designed the above 2D robot arm for this project during his Master Program.